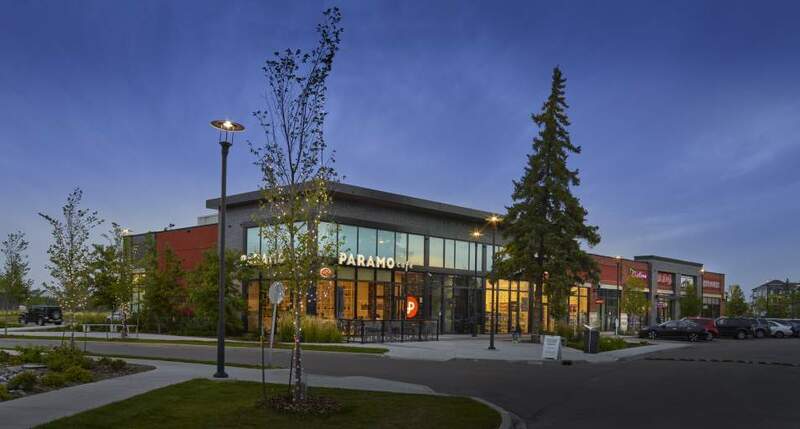 Griesbach Village is a 13.23-acre site strategically located on the northwest corner of 97th Street and 137th Avenue, the most significant intersection in North Edmonton, with traffic counts in excess of 76,000 vehicles a day. This exciting development is anchored by Shoppers Drug Mart and will contain 109,000 square feet of prime commercial space when fully complete. Approximately 4,800 people currently reside in the former military base of Griesbach and at full build-out there will be over 14,000 residents within walking distance. Minutes from downtown Edmonton, at one of the city’s busiest intersections with four entrances off of major arterials, makes getting to Griesbach Village an easy task. Premium finishes and accessibility make this urban infill site truly unique in north Edmonton. Griesbach Village is an urban infill subdivision being built on the historic Griesbach military lands just minutes north of the provincial capitals down town area. This growing shopping centre sees more than 230,000 people in Edmonton trade in for their retail needs and is located at one of the busiest intersections in the city with more than 76,000 vehicles passing by per day. Approximately 4,800 residents currently live in the Griesbach neighborhood and at full build out there will be over 14,000 residents.